There are various ways that you can get to the islands of your choice in Malaysia whether you choose to travel by car or bus. If you are already in the state of Penang and Langkawi is your next destination, then taking the ferry is your answer. What better way to travel than by sea as you look out to the window view of beautiful skies and water? 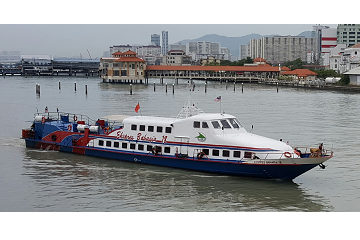 Start your trips from Penang to Langkawi the right way with one of the most reputable ferry companies based in the beautiful state of Penang is Super Fast Ferry Venture Sdn Bhd. Whether you are planning to obtain your scuba diving license in Langkawi or return to Penang to continue to your next adventure, Easybook is here to help you kick start that adventure. Get a ferry ticket at Easybook for Super Fast Ferry Venture within minutes when you book it through our website or mobile app wherever and whenever you want. Here is a simple-to-follow guide to help you navigate through Easybook website to ease up your booking process. Super Fast Ferry Venture or also known as SSFV allows the passengers to travel with high-speed ferry services between the two islands. If you are coming from Penang, you can head over to Swettenham Pier or also known as the Penang Jetty Terminal. This is one of the oldest transportation terminals around that also act as a connecting point for the Rapid Penang buses. It is super easy to get to the Penang Jetty Terminal with the bus services available from other stations like Sungai Nibong Bus Terminal, Butterworth Bus Terminal, Penang Sentral and even Bukit Mertajam Train Station. You can also get there by cab, as there is a taxi stand nearby the Penang Jetty Terminal for your convenience. If you are leaving from Langkawi, head over to Kuah Jetty Point which is also known as the Langkawi Jetty Terminal. If you are coming from Kuah Town Centre, it takes about 5 minutes by car to arrive and just 15 minutes by feet from Eagle Square. Over at the jetty, you can either rent a car from various services that you can find at the mini complex. Otherwise, just hop on a taxi by the main entrance to take you to your location. If you have already booked an accommodation, do check in advance if they offer shuttle services to and fro the Langkawi Jetty Terminal. Make sure to print out your tickets before boarding, otherwise you will be required to pay for printing fee at the counter. People travel between Penang and Langkawi Island so frequently that they have become two of the top attractions in Malaysia. It is important to book SSFV tickets ahead of your travel time to avoid disappointment especially during peak seasons. The fares are reasonably priced at RM80 per adult passenger and RM60 for children aged 2 to 11 years old. If you arrive earlier than your scheduled booking for Super Fast Ferry Venture ticket at Penang Jetty Terminal, you can check out the coastal road of Weld Quay by the shoreline of George Town city. Besides the infamous Swettenham Pier, you can also find amazing landmarks such as Wisma Yeap Chor Ee, which serves as the hub for start-up companies in the tech community residing in this historical spot. You can also find the Made in Penang Interactive Museum where you are able to take pictures with the trick art or 3D murals created by artists from Penang for some mind trickery. Grab a quick pancake snack by Lebuh Downing at Noor Azam Apam Balik’s mobile stall in front of the General Post Office. Otherwise check out Yin’s Sourdough Bakery for a fresh loaf of bread to fill the tummy while waiting for the ferry. Alternatively, there’s also Beach Road in Penang or known locally as Lebuh Pantai which is mainly the business district of George Town and is one of the oldest streets in Penang. Landmarks located at Beach Street are the Standard Chartered Building, HSBC Bank Building, Penang State Islamic Council Building, Bank of China Building, OCBC Building, Logan Building and India House for great photo opportunities. When you are at Langkawi Jetty Terminal or also known as Kuah Jetty, you will find the two-storey shopping mall Jetty Point Complex right by the entrance. There are lot of things you can get over here such as electronics, souvenirs, gift ideas, chocolates and more. You will find a lot of tour agencies in here, along with lots of places to eat from fast food joints to stalls to grab a quick bite before you board your ride with SSFV. SSFV is always ready to either take you to Langkawi to escape the city life and Penang for all your hiking plans. Travel safely and conveniently when you book your ferry ticket for Super Fast Ferry Ventures through Easybook. Gone are the days when you have to be queue up at the counter for your tickets. Just follow this guide on How to Use Easybook for your next bookings on our platform.